The biggest problem I have found when preparing Pho soup is the lengthy time it takes to make the perfect broth. 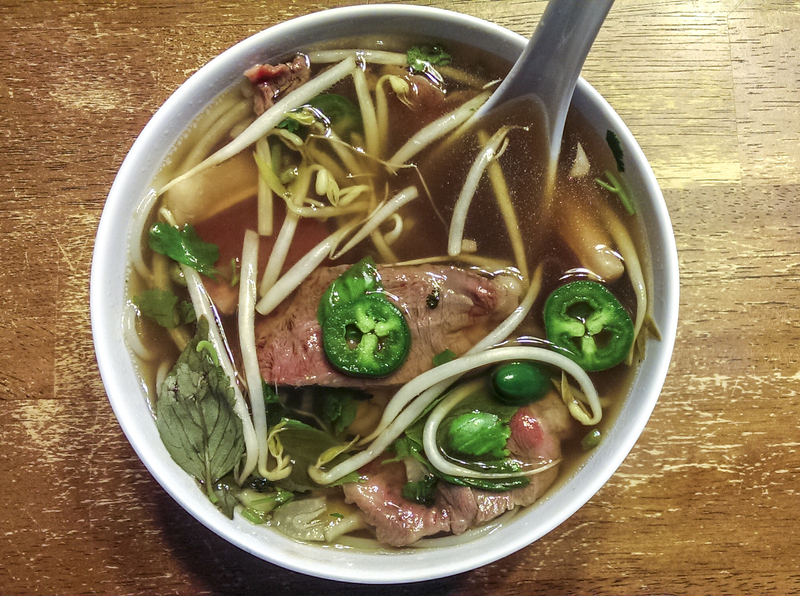 Traditionally, Pho broth can take up to 10 hours to simmer. To me, that’s a lot of time smelling the aroma of the soup throughout the house and not eating it. I really do not have much patience when the house smells like good food all day. It reminds me of starving all day before Thanksgiving dinner. The other difficulty with traditional Pho recipes is that it requires some ingredients that are not easily available at local markets or are expensive. Using chuck roast or beef leg bones can be expensive and somewhat of a waste. I am including alternatives in this recipe I have found to work just as well. In a large pot, add the ground meat and break up. (I use ground beef because it has a greater surface area and will flavor the meat faster). Fill the pot with water until the beef is covered. Put on stove and bring to a boil. When the pot has reached a boil, continue to boil for a few minutes. Drain the meat in a colander and rinse the meat well. The trick here is to get the beef to be as clean as possible to produce a clear broth. If you are using a chuck roast instead, you can skip this first part and go to the next step. For the chuck roast, cut up the pieces small. Add ground beef back to the pot. Add the onion quarters. If you have access to a grill or gas stove, char the onions for a bit. It adds a nice flavor (this is optional). Also add ginger, broth, fish sauce, cinnamon stick, cloves, anise, pepper and sugar to the pot. Simmer broth for 50 minutes (about 1.5 hours if you are using beef chuck instead of ground beef). Using a separate large bowl or pot, drain broth with a colander into bowl. Discard solids; we are going to use the broth. Next we need to work on getting the broth nice and clear. If you are using chuck roast, skip this step. If you have cheesecloth (folded a few times), that will do nice. If you don’t, you can use paper towels. Add cheesecloth or paper towels to colander, and pour broth back into pot. Repeat this process a couple times until you can see through the broth. Put the broth back into the pot and keep warm on a low setting. Grab the rib eye steak, or whatever steak you want to use, and very thinly slice them into around 2″ shapes. The slices need to be thin enough for the broth to cook them. I would aim for about 1/16″ if you can or less than 1/8″. If you do not have a very sharp knife to cut the steak, put the steak in the freezer for a while to harden. To prepare the noodles, you can simply follow the instructions on the package. Pho noodles are similar to cooking fettuccine noodles. Be careful not to boil the noodles too long so they are mushy. You want them to be al-dente like a good fettuccine because the hot broth will cook them longer. Drain noodles and rinse them with room temperature water to remove excess starch. Add a tiny bit of vegetable oil if they are extremely sticky. Next, prepare your bowls by adding some of the noodles and sliced steak. Lay the steak flat to ensure the broth covers it completely. Yes, I do realize the steak is raw. The boiling broth will cook the steak. If this freaks you out, you can add the steak to the pot of boiling broth before you add them to the bowl. The point is, however, to eat the steak immediately after it’s cooked. Now, turn up the burner that the broth was on from low to high. When broth begins to boil, immediately pour into the individual bowls of noodles and sliced meat. Make sure the meat is covered. If they float a bit, you can push them down with a spoon. You will notice they start cooking and turning color once you push them down. Now you can add your garnishes. I like to add some bean sprouts, thin onion slices, 1-2 jalapeno slices which go very far, 2-3 basil leaves, a squeeze of lime juice, some salt if needed, 1/2 teaspoon of hoisin sauce, and 1 mint leaf.